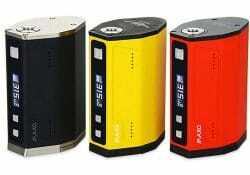 The iJoy Maxo is the first ever quadruple 18650 box mod, but it will also work with just two battery cells. Ijoy took 6 months to develop this mod which features up to 315 watts of power and temperature control. It is available in red, yellow, blue or a more expensive limited edition blue.